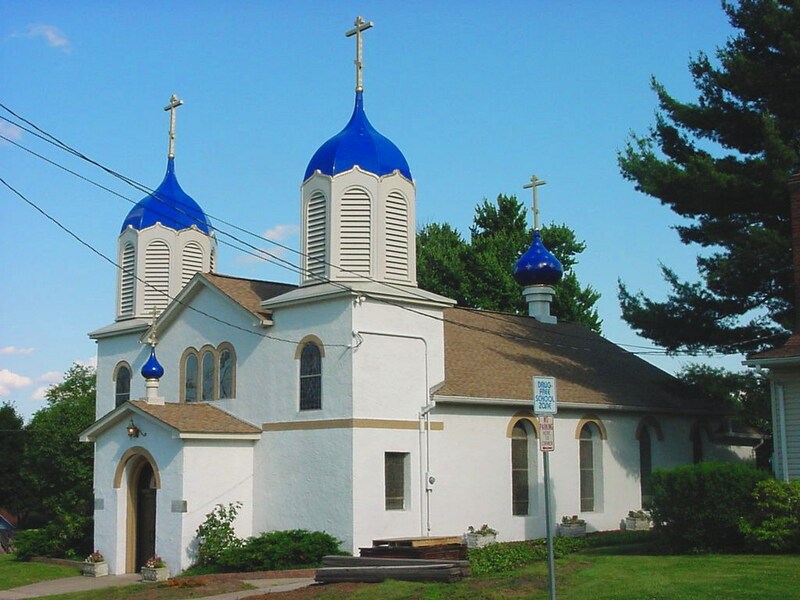 In 1915, three years after the John-Manville Corporation constructed its first building in Manville, a group of families of Russian heritage met to organize a parish of the Orthodox faith. With the blessing of the ruling bishop, Archbishop Evdokim of New York and under the leadership of Fr. Peter Semashko, the rector of Ss. Peter and Paul Church in South River, this was accomplished. In the beginning the parish consisted of a small group of believers that rented a building in a lumber yard on North Main St. In this makeshift structure, with bare necessities, the divine services were held. In 1916, six lots were purchased on a rise of ground known today as Washington Ave. Later, six more lots were obtained. In this same year, an 18 foot by 37 foot wooden chapel was built by the parishioners themselves. In 1922, the structure was destroyed by fire. Undaunted by this misfortune, the parishioners realized the need to build a larger church. After the foundation for a new church was completed, since sufficient funds were not available; it was decided to make the basement structure the temporary house of worship. In 1935, fire again consumed the church building. It was in this early period of foundation that 2 acres were purchased in Hillsborough Township for the beginnings of a parish cemetery. When fire destroyed the church in 1935, plans began immediately for the reconstruction of the temple. On June 6, 1936, the present church edifice on being completed, was consecrated by Metropolitan Theophilus, the primate of the Russian Church of America. During the ensuing years, the parish developed with an increased membership and material well-being. The old rectory was completely renovated; major improvements were made to the interior and exterior of the church; the parish cemetary in Hillsborough was newly-paved and perpetual care system was instituted for the cemetary. In 1949, plans were made for the building of a new rectory. The former rectory was converted into a multi-purpose building. On the first floor church school classes were held and on the second floor were kitchens facilities, a shower room and recreational rooms used by parish organizations. In 1955, the parish purchased five acres to add to the parish cemetary. The following year, stained glass windows were placed in the church, and in 1957, three bells - 600, 300, and 225 pounds each were installed with an electric ringing system. The Church continued to be adorned with the placement of an altar and lecturns, and the present parking lot was secured. In 1962, a fire caused extensive damage to the sacristy area of the church and work went on immediately to refurbish the church interior. In February of 1963 the church was blessed after all repairs had been made due to the fire. On October 10, 1965, the new educational-social building was dedicated and blessed by Metropolitan Ireney. The parish now had classrooms, a gym-hall, kitchen, coatroom, bar, storage area, lower hall and library room. The year of 1966 marked the Golden Jubilee of the parish. On October 16 the 50th Anniversary Banquet was held with Metropolitan Ireney presiding at the Divine Liturgy. A commemorative book was prepared as was a Golden Jubilee Float. The renowned theologian, Protopresbyter Alexander Schmemann gave the address at the banquet. A two volume photo album was made and added to the parish library. Parish organizations during this period included: the Sisterhood of the Myrrh-Bearing Women, Parent-Teacher Association, Russian Orthodox Club ("R" Club) chapter 143 and Junior "R" Club. Members of these organizations did much to contribute to the prosperity and fellowship of the parish. During these years the parish had an all-time large census of some 450 adults and 130 children. These were years of slow transition from a local community to one that served Orthodox believers in neighboring counties. The Russian character of the parish gave way organically to an American coloring and English became the dominant language. Shortly after autocephaly was granted to the Orthodox Church in America, the parish adopted the new name of "Ss Peter & Paul Orthodox Church." The dropping of the word Russian was not seen as a lack of appreciation of the contributions of the Slav people of the parish; but rather as a reflection of the multi-ethnic and all-embracing nature of Orthodoxy. The parish founded by Russians and Carpatho-Russians, over the years assimilated Serbs, Romanians, Irish, French, Macedonians, and Americans. The parish of Ss Peter & Paul was for all Orthodox believers of all backgrounds. This was a period of inner growth and reflection of theological understanding. If the period of the 1950-1960s was one of external parish building, the 1970's through the present time is one of internal self-understanding of what it means to be Orthodox in pluralistic America. The parish was revitalized in accordance with traditional liturgical practices and sound theological principles. The needs of the youth were given primary attention. A new iconostasis was installed in the church complete with Byzantine icons. The church decorum, parish by-laws, and parish organizations were re-structured in conformity with general Orthodox norms. Attention continued to be focused on the inner principles of church life. Eucharistic participation, observance of lenten periods, sound fund-raising means and awareness and participation in Orthodox liturgical services and fellowship with other parishes was stressed. In 1980 the parish celebrated its 65th Anniversary. To mark that event, the church was newly painted inside and out and carpeted anew. The beginning of a new period of iconographic restoration began with the placing of the Icon of the Mother of God over the altar. In the following years traditional icons were placed on the walls, panel icons of new saints were painted, new vestments, carved analogions and stands, coverings, and other holy articles. In 1984, central air-conditioning was installed. In the same year the parish adopted the "First Offering" stewardship means of financial support. With the blessing of Archbishop Peter, a charitable society, dedicated to St. Philaret the Merciful, was established in 1985 to provide for the needs of individuals of the parish, community, and church institutions. Since 1985, capital improvements were made to the parking lot, cemetary, the purchase of new tables for the hall, payment of debts, and the complete restoration of the parish rectory. The Church interior and exterior were painted. In addition, the entrance to the lower hall was redone and a new church roof installed. By education, and by being guided by the example of older parishioners, the young people of the parish are assuming their roles in the parish council, choir, social affairs, and community life. In 1990, the parish celebrated its 75th Anniversary. In the year 1990, the parish celebrated its 75th year anniversary. Archbishop Peter led our liturgical celebration, and Basil and Barbara Kulick and Peter Hnatuk served as chairpersons for the celebration. In preparation for this jubilee, several beautification projects were undertaken, including the installation of the altar icon of “The Self-Sacrificing One” with the Six Hierarchs. An icon of Ss. Peter and Paul, gold altar covers and new priest and altar server robes were donated, and in the cemetery a memorial cross honoring our departed was dedicated. A Parish Pictorial Directory and Commemoration Book were also published to mark the occasion. In 2014, on the Feast of Ss. Peter& Paul (June 29th), we embarked upon the “Pre-Feast” of our 100th anniversary. In the same year to commemorate our 99th Anniversary, a Celebration of Faith and International Food Festival was held as out-reach to the community. Jill Peterson was chairperson for this memorable event, ushering us into this year of 2015. On October 3rd and 4th, festal celebrations will take place marking our 100th anniversary, which will be our “Feast.” This observance will consist of liturgical worship and fellowship. Chairperson for the 100th Anniversary Celebration is Pam Stone, who is working with a very dedicated committee. The year 2016 will be our “Post Feast”, concluding a three year celebration of remembrance and thanksgiving for the past, critical evaluation of the present, and spiritual re-commitment for the future. Worship has remained at the heart of who we are as the People of God. In the 25 years between the 75th and 100th Anniversaries, our parish has continued on the path of good liturgical services and offered worship not just on Sundays, but multiple times during the week. The Saturday Vigil service was re-introduced, and during Great Lent, there are services daily, which has been the practice for the past 38 years. During these years, there were twenty-eight parishioner and eight non-parishioner Baptisms, nine people were received through Chrismation, eleven marriages, forty-five funerals of parishioners and twenty-eight non-parishioner funerals, and two Ordinations (Proto-deacon Paul Sokol to the Diaconate on October 18, 1995, and Fr. John Parsells to the Priesthood on July 1, 2006). Hierarchs who have visited in these last 25 years include Archbishop Peter, Archbishop Michael, Metropolitan Herman, Bishop (now Metropolitan) Tikhon, Bishop Nicholas (Carpatho-Russian); Metropolitan Dimitri (Georgian); Bishop Peter (Russian Synod); and Archbishop Anthony (Georgian). The generosity and love of parishioners for their church has been demonstrated throughout the years in the form of free will offerings. One of the most remarkable achievements of this time period has been the “Adornment of the Church.” Since 1990, maintenance and repairs have been made to the church building to both upgrade and preserve optimal use. For example, protective covering was obtained for the stained glass windows. In 2004, the original wooden bell towers were replaced and new cupolas were added. The parish is most thankful to Robert Smith, the parishioner who chaired this very involved project. These new towers house the original bells – named, according to tradition, after the Archangels Uriel, Salaphiel and Jegudiel – which remain in faithful service. In this same 25 year period, generous free will offerings allowed for the purchase of vestments, coverings, carved wooden items, and many other blessed objects. It was in during this past 25 years that the interior of the church was beautified by noted iconographer George Filippakis, with the assistance of our parish iconographer, Austin Kachek. Through generous offerings, four icons of select martyrs and 8 angels were installed on the ceiling. Twelve side wall icons representing the different categories of saints and two side wall icons from the lives of Ss. Peter and Paul were added. The icon “It Is Truly Meet” and the Tetramorph icons now adorn the area behind the kliros, and the back walls now hold two icons, one of the Prophesy of Ezekiel, and the other a representation of Paradise. 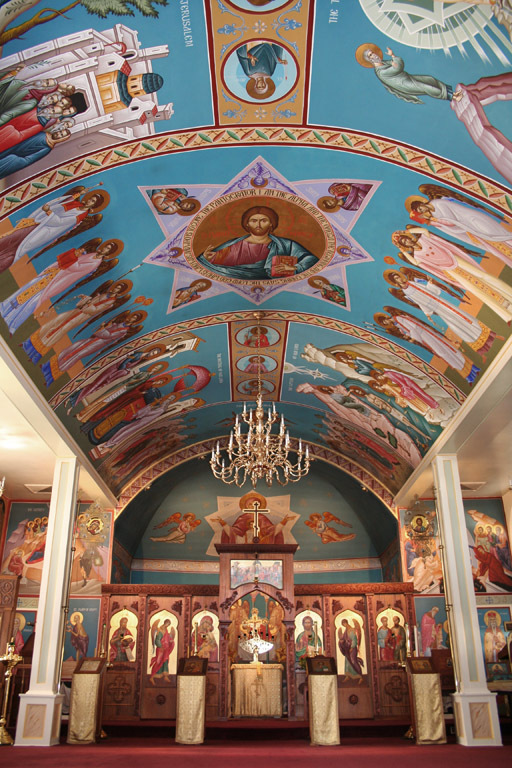 Additionally, four large feast day icons were installed on the ceiling. Praise the Lord! May He be mindful of such generosity and grant good health and salvation to the living and memory eternal to the departed in whose names these donations were made. Parishioners’ generosity has extended beyond beautification of the church to include many church furnishings, the replacement of lighting with 5 new chandeliers, the acquisition of 8 portable icons, new clergy and altar server vestments, and altar coverings. The church has also been blessed with generous offerings of parishioners through their wills and estate planning. During the last 25 years the church received gifted funds totaling $176,000 from the estates of: Fr. Jaroslav Roman; Mary Holovach; Helen Homiak; John Jackowlew; Stella Seminuk; Nadia Marchuk; and Anna Tarangul. May the Lord be mindful of their love for their church and grant them Memory Eternal. The cemetery has experienced a radical transformation during the past 25 years. For years, the cemetery was largely “forgotten.” In 1997, parishioner Jerry Yadlowsky expressed a desire to beautify the cemetery and made an initial gift of $80,000. In the subsequent years, private donations continued to be given to further enhance the beauty of the cemetery. Chief among the improvements were road expansion, placement of iron fencing and gate at the front of the property and of white fencing and benches, property clearing and the planting of nearly 200 new trees and close to 300 shrubs, installation of an electric line, and the addition of a water supply. Finally, professionally-printed brochures offer a glimpse into the love, dedication, and fruits of these efforts. In the ensuing years, Jerry, both personallyand with helpers, continued to provide for the upkeep of the many plantings. Our benefactor has since departed this life, but the church parishioners have responded generously when unforeseen repairs have been required and for general ongoing maintenance. Memory Eternal! The cemetery is open to all Orthodox Christians for burial, and offers an environment to allow for reflection and prayer for the departed. Over 750 departed currently repose in this beautiful cemetery. Memory Eternal! At the time of the founding of the parish, the majority of members were local, coming from the Manville neighborhoods. However, there is now the blessing of reaching out further than the borders of Manville. The majority of the parish is spread throughout Somerset, Middlesex, Hunterdon, and Ocean counties. The ethnic demographics of the parish have also evolved to represent a more all-inclusive “pan-Orthodox” parish. 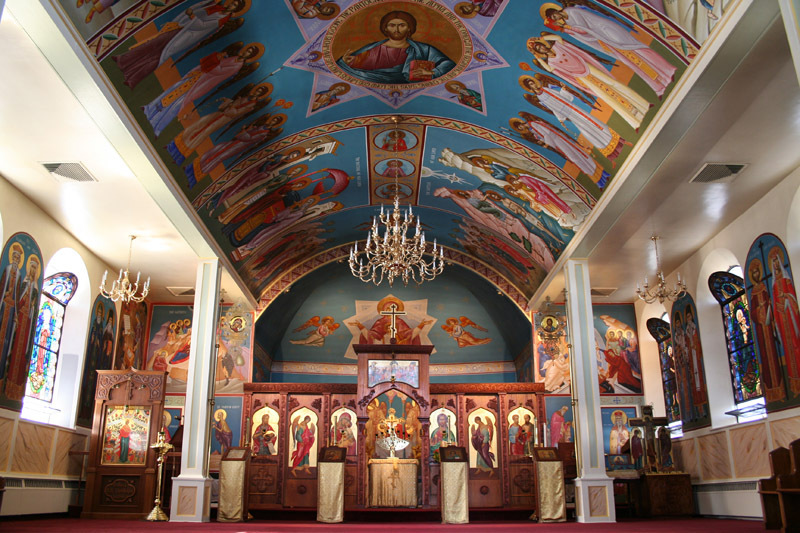 The parish benefits from a wealth of ethnic backgrounds which include Russian, Ukrainian, Romanian, Georgian, Greek, Serb, and other ethnic backgrounds. While the Slav liturgical tradition is followed, the parish strives to incorporate saints and customs of all Orthodox lands. Ss. Peter and Paul has been blessed to assist other new or growing communities. The Mother of God Church in Rocky Hill was established by parishioners from Ss. Peter & Paul in 1998. For a few years we shared our church with the Georgian community for Thursday evening services and holy days. They used the social center for language classes and cultural dancing. Recently, they secured a building for themselves in Manville for their new parish, St. Grigol. For a period of nearly 8 years, the Coptic Community of St. Mary and St. Athanasius utilized the upper hall for church services and our lower hall for social and educational purposes. In June 2015 they moved toa new, permanent location in Hillsborough. The parish has a presence in Manville and has served the community in the recent past by providing space for the Manville Food Pantry and Baby Keep Well Clinic, providing needed labor and support during the aftermath of Hurricane Floyd, and continuing to offer assistance to any who are in need through the Society of St. Philaret. Sadly, over the past 25 years, the parish has fallen victim to the same circumstances that plague other church communities which result in a decline in overall census. The parish council and committed parishioners have striven to address the concerns of morphing into a “small parish.” Outreach events have included Open Houses, Sunday Open Door, Food Festivals and various educational opportunities for the community. In this, we the faithful would follow in the footsteps of our patrons, Ss. Peter & Paul. This work remains primary. It was after all, a small number of only 12 Apostles that advanced the schema of our Lord. In this period of time, namely the last 25 years, a new understanding of church life has developed. Under the guidance of Archbishop Michael, parishes have been made to feel part of the diocese and parish council members responsible for sharing in the spiritual and educational aspects of the church at the deanery and diocesan level. Greater initiative has been taken by lay leadership in professional expertise and talents. Many of our young people have begun to participate in Orthodox summer camps and other inter-parish activities. Our parish church school has been revitalized with dedicated teachers and an energetic group of youth. Social media has become part and parcel of communicating not only to parishioners, but sharing with others on the parish web site and other media outlets. In 2013, the St. George Gazebo was built as an Eagle Scout project by youth parishioner Zachary Sokol with the help of family, parishioners and friends. Archbishop Michael blessed the gazebo, and, through God’s grace, the structure stood completely unaffected by Super Storm Sandy, including the icon of St. George which hangs inside. It has become the place to go for quiet conversation and reading. The history of a parish is in a real way a continuation of The Acts of the Apostles. This New Testament book reveals the labors of the “co-workers” of Christ, the Apostles and the activity of the churches of God. The mission of Ss. Peter & Paul Church in Manville is no different than the ancient churches of Corinth, Rome, Ephesus and Jerusalem. Although centuries and continents apart, the meaning of our existence as a local church is to proclaim Jesus Christ, “the same yesterday, today and forever” (Hebrews 13:8). Our beloved spiritual father, Archbishop Michael on the occasion of our 100th Anniversary instructs us: “The future will be bright for us only if we are willing to devote our time and efforts to bring the Gospel of Jesus Christ to a society that has strayed from His path. Our Lord must be the object of our worship, the theme of our sermons, the pattern of our lives, and the inspiration of our ideals. Others must experience His presence when they visit our church. For this to happen, every member of Ss. Peter and Paul parish must be totally dedicated to servicing the Lord and His church”. O Holy Apostles, Peter and Paul, pray unto God for us!